The Frederick Hart Museum grand opening at Belmont University in Nashville, Tennessee, March 28, 2019. 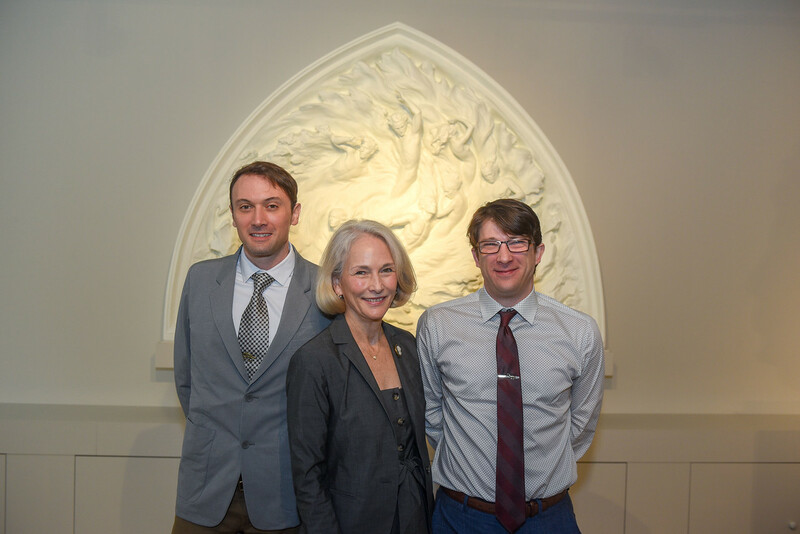 On Thursday, less than four months after announcing a multi-million dollar gift of more than 250 works of art, Belmont University celebrated the dedication of the new Frederick Hart Studio Museum. Lindy Lain Hart, the artist’s wife, and Bob Chase, Frederick Hart’s publisher and president of the Frederick Hart Foundation, donated the works on display and were present for today’s event, along with other friends, family members and supporters. Deemed one of America’s greatest sculptors, Frederick Hart (1943-1999) created works that forever changed the national landscape such as Washington National Cathedral’s Creation Sculptures and Three Soldiers bronze at the Vietnam Veterans Memorial. Hart was also distinguished as the 2004 recipient of the National Medal of Arts along with other significant commissions, awards and achievements during his lifetime. The largest permanent collection of Hart’s work available for public viewing, the museum offers art enthusiasts a unique opportunity to view Hart’s artistic process as the space includes works in various stages of development, molds, plasters, sculpting tools, artifacts and completed sculptures. The Museum also features a full size Christ Rising, bronze, which was gifted to Belmont by passionate Hart patrons Lee and Pam Kennedy of Sarasota, Florida. Located inside Belmont’s Bunch Library, the Museum will be open from 9 a.m.-5 p.m. Mondays thru Saturdays and 1-5 p.m. on Sundays. Belmont students, faculty and staff will have free access to the museum, and tickets for the general public are $5. Belmont President Dr. Bob Fisher examines Frederick Hart’s desk in the Hart Studio Museum. With architect ESa and R.C. Mathews Contractor, Belmont has recreated Hart’s working studio and provided display space for the collection. The first floor of the campus’s Lila D. Bunch Library—already home to the prestigious stringed-instrument collection, the Gallery of Iconic Guitars (The GIG), and the Leu Art Gallery— has been selected as a synergistic location. Together these unique artistic endeavors offer a dynamic collective to further enhance the student learning experience, attract leading scholars to explore Hart’s artistic contributions and promote further awareness of Belmont’s pursuit of excellence in the arts. In addition, the Hart Studio, the GIG and the Leu share a Nashville Trolley Tours stop with the Belmont Mansion, making this portion of the University campus a historical highlight for any Nashville visitor. Visitors to the Hart Museum will find they are surrounded by multiple mediums from mere sketches to completed works by Hart. Included is an extensive presentation on Hart’s innovative use of clear acrylic resin, the medium Hart pioneered to cast figurative forms which he described as “sculpting with light.” This innovation led to a patent for the process to embed one clear acrylic sculpture within another. The museum will also focus on historical and biographical insights into Hart’s life, and experiences that shaped his ideals and his critical positioning of the importance of the human figure in the visual arts. The Museum is, in a very tangible sense, creating a sacred space for the viewer.